More limited than other carriers, since onbus are really best for older, independently sitting babies and only designed for back carries. Panel size is dependent on child's size. Therefore a parent who chooses to wear as their baby reaches toddlerhood or preschooler age may need to upgrade to a toddler-size or preschool-size carrier. X-Onbuhimo or Blanketless Onbuhimo: Functions the same as a traditional onbu, but instead of separate straps and body panel, it is constructed in an "X" shape with two narrow slings. 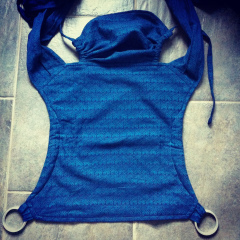 Buckle Onbuhimo: a body panel with backpack-like buckle straps and no waistband. If you are interested in drafting your own pattern, check out the construction basics (specifically x boxes and body panel layers) and the basic measurements of straps and body panels. A basic beginner's tutorial: Onbuhimo_Basic.pdf This tutorial is a great place to start if you want to combine elements from different tutorials. Start here, and use other tutorials to figure out how to add shaping to your body panel, padding to your shoulder straps, or other features.